On February 18, 2016, COL "Chad" Chadwick, USA (Ret. 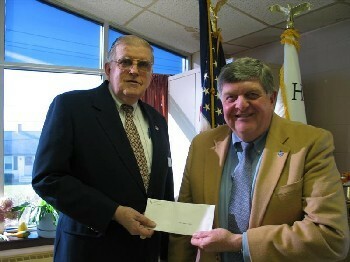 ), president of the chapter, presented a check to the NH Veteran's Home at Tilton, NH, for $400 to their recreation activities fund for field trips and other activities not supported by the State. The money was raised from our members at chapter luncheon throughout the year. At the annual meeting luncheon on November 5, 2011, the chapter again passed the “basket” for the Christmas program for the residents of the New Hampshire Veterans Home in Tilton. The members in attendance generously donated $537.00 to help purchase Christmas gifts for the residents to assure that those without families will not be forgotten at the holidays. In addition, past president Joan Huber once again purchased and addressed Christmas cards for all the residents at the Veterans Home. Chapter members took as many cards as they wanted. They then could write a short note, stamp and mail them. This tradition has become very popular with chapter members and well received by the residents. 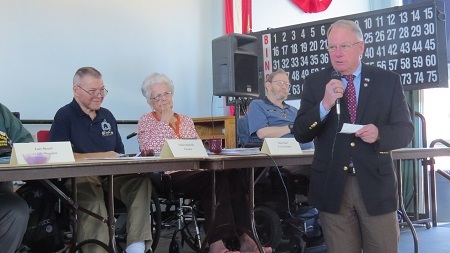 At the annual meeting luncheon on November 13, 2010, the chapter again passed the “basket” for the Christmas program for the residents of the New Hampshire Veterans Home in Tilton. The members in attendance generously donated a record $725.00 to help purchase Christmas gifts for the residents to assure that those without families will not be forgotten at the holidays. At the annual meeting luncheon on November 8, 2008, the chapter passed the “basket” for the Christmas program for the residents of the New Hampshire Veterans Home in Tilton. The members in attendance generously donated $453.77 to help purchase Christmas gifts for the residents to assure that those without families will not be forgotten at the holidays. Shown below, LTC Stephen Waterman, USA (Ret.) 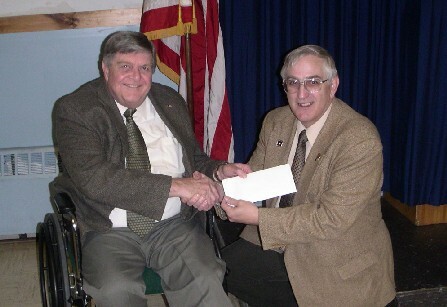 presented the check to Alice Brown, Assistant to the Commandant of the NH Veteran's Home at Tilton, NH, on November 24,2008. In addition, outgoing president Joan Huber once again purchased and addressed Christmas cards for all the residents at the Veterans Home. Chapter members took as many cards as they wanted. They then could write a short note, stamp and mail them. This tradition has become very popular with chapter members and well received by the residents. On November 18, 2007, LTC John Graham, USA (Ret. ), immediate past president of the chapter, presented a check to Barry Conway, Commandant of the NH Veteran's Home at Tilton, NH, for $350 for use in providing holiday gifts to the residents at the Home. 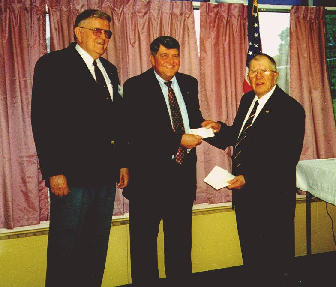 The money was raised from our members at the Chapter's Annual Meeting Luncheon on November 10, 2007. At our September 2005 meeting we collected items for the Sunshine Cart at the New Hampshire Veteran's Home in Tilton, which delivers to all veterans once a month who are unable to go out for shopping trips. They get to choose up to three items from the cart. Lisa Perry, Volunteer Coordinator was thrilled with our donations. It will keep their cart going for quite a while. We donated $190.00 plus 7 boxes of Kleenex, 6 bottles of mouthwash, 3 boxes of envelopes, 8 pads of writing paper, 7 chapsticks, 7 combs, 4 toothbrushes, 12 Vaseline Intensive Care body lotion bottles, 5 bottles of shampoo, and 2 bottles of sun block. On November 24, 2003, Maj Edward N. Warfield, USAF (Ret. 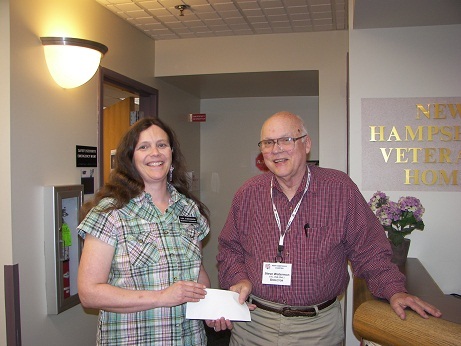 ), the Chapter's representative to the New Hampshire Veteran’s Home at Tilton, NH, presentaed a check to Barry Conway, head of the Veteran's Home, for $350 to be used to purchase over the bed tables for use by the residents of the Home. On May 28, 2001, as part of Memorial Day ceremonies at the NH Veterans Home, Maj Edward N. Warfield, USAF (Ret. ), Chapter Secretary, and 1stLt Arnold C. Sayer, USAF (Ret. ), Chapter Treasurer, presented a check for $1,450, on behalf of the New Hampshire Chapter, to Barry Conway, head of the New Hampshire Veteran’s Home at Tilton, NH. The money will be used to purchase a Doppler unit for the Home. This devise aids doctors in assessing limb circulation problems and is the Home’s number one medical need not funded by state or federal governments. The Doppler unit costs $1,000. The Chapter normally donates $500 per year to the Veteran’s Home and had asked for donations to make up the difference. Not surprisingly, the Chapter exceeded its goal of raising an additional $500. Thanks to all who have contributed to make this donation to the Veteran’s Home a reality!